Join the SE Uplift Board! SE Uplift is seeking passionate community members, community organization representatives, and business association representatives to join our board. We are looking for people with the time, drive and skills to guide SE Uplift’s work and help us accomplish our mission. We encourage anyone who is eligible and interested to apply, whether you’re an emerging community leader looking to get more involved or a seasoned professional interested in giving back. 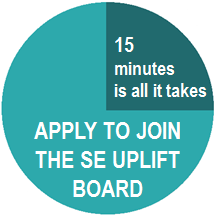 The SE Uplift Board seeks diversity in gender, race, ethnicity, age, economic status, professional and volunteer experience, education, physical ability, and more. Since 1968, the SE Uplift Neighborhood Coalition, a 501(c)(3) nonprofit organization, has provided critical staff and organizational support to thousands of volunteers fostering safe, vibrant and diverse neighborhoods within our coalition. SE Uplift empowers citizens to effectively resolve challenges and uplifts communities through a variety of skill-building trainings, resources, and neighborly support. At the core of our work is a desire to build the capacity of all community members to effectively and collaboratively advocate for their own community needs. To support this outcome we work to broaden and deepen the involvement of more and diverse members of our community in local decision making. The SE Uplift Board of Directors supports this work by providing mission based leadership and strategic governance. Serving on SE Uplift’s Board is a great way to give back to your community, elevate the concerns of your community, and help build a vibrant civic engagement system in Portland. Working with similarly engaged people from our area, you’ll find many opportunities for coalition-building, and shared learning. You’ll gain leadership skills, shape important city policy, learn about how the city functions, and meet many wonderful and talented people. What’s involved in board service? Attend board meetings held on the first Monday of every month from 7 to 9 PM. Select, evaluate, and support the Executive Director. Ensure that the appropriate organizational structures are in place to support mission and strategic plan; this includes bylaws, policies, and committees. Actively participate in an annual strategic/operational planning process to set goals for achieving the organization’s vision, mission, and purpose. Uphold the values and mission of SE Uplift. Reside, own property, or own a business within the SE Uplift area and have special expertise, relationships or interest. Ability to work collaboratively with people of diverse perspectives and experiences, and to contribute to a successful group work. Open mindedness and commitment to making the best decision for the whole organization. A commitment to social justice and an understanding of the importance of equipping a deep, diverse bench of community leaders with the skills and networks they’ll need to make an impact. Contact SE Uplift’s Community Resource Program Manager, Kelly Fedderson, at Kelly@seuplift.org or 503.232.0010 ext. 312.